The varsity girls’ basketball team prepares to take on anything this season. Starting on November 13, the season began in their game against Hinsdale Central. Some of the team goals for this year include making at least 13 total wins, making the first winning season in school history, and making it first in Regional Championship. Senior Shannon Smith, varsity player, brings experience, toughness and leadership to a team of young Varsity players, according to her coach. A few others provide a line up to the team as well. “Junior Phoebe Hillery has one of the best basketball minds we’ve ever coached. She also will provide us with ball-handling as well as an improved offensive game which she developed in the off-season,” said Head Varsity Coach Lincoln DePaula. “Sophomore Aniya Mabry is one of the most athletic guards in our conference. She has the potential to become just the second girls’ basketball in school history to receive a Division I scholarship,” said Depaula. Aniya started several games as a freshman on the varsity team last year. “Sophomore Leia James led Varsity in assists as a Freshmen last year. This off-season, she worked very hard on her offensive game, and will be counted to add some scoring on top of her stellar defense,” said DePaula. Some varsity newcomers include: junior Kiersten Ricko, sophomores Fatima Syeda, Fatimah Olagunju, Jasmine Divinity and freshmen Grace Harris and Bri Smith. 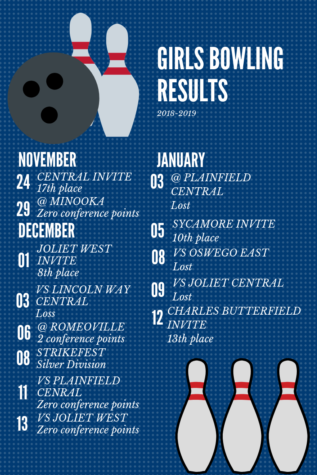 They won 60-48 in their first game against Hinsdale Central and are up against Minooka High School on December 6.